GOP Rep: #MeToo Is A Movement Toward Victimization - Joe.My.God. “You’re just supposed to believe somebody because they said it happened,” Mr. Cramer said, alluding to Christine Blasey Ford — who has accused Justice Kavanaugh of sexually assaulting her when they were teenagers — and, more broadly, women who have come forward to claim that they were sexually abused or assaulted. RELATED: Cramer last appeared on JMG in April when he compared voting against Trump to cheating on one’s wife. Last year he mocked female Democrats for wearing white pantsuits to a Trump speech. Cramer said, “There is a disease associated with the notion that a bunch of women would wear bad-looking white pantsuits in solidarity with Hillary Clinton to celebrate her loss. You cannot get that weird.” Cramer basically opposes civil rights for everybody except white Christian men and is known to quote scripture in his rants against food stamps. 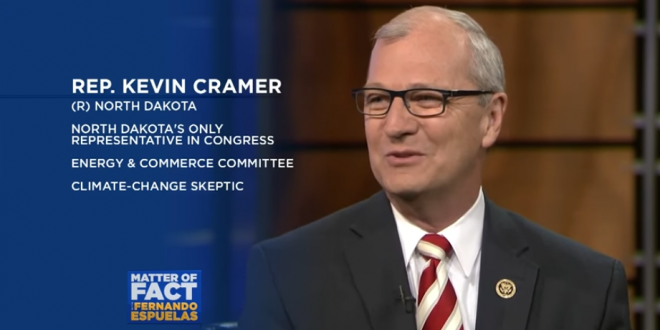 Cramer sought and received the endorsement of anti-LGBT freak show Eugene Delgaudio for his Senate run against Heidi Heitkamp, whom he is currently leading by ten points.